I know you absolutely love learning random facts about yours truely, so here's three more things to add to your list of reasons why I'm crazy awesome. Hi, I'm Krista and I think I'm the coolest thing since sliced bread. 2. I love grocery shopping. I could seriously spend hours at the grocery store. It's like a giant Food Land, and I love just browsing down every aisle and looking at all of the different kinds of food. I also frequently take pictures of my grocery haul, but those pictures never make it to the blog because I always have so much other stuff to write about that's just so much more interesting than my groceries. I mean who wouldn't want to read about me eating a chicken salad or the fact that one time I added Doritos to my chili? If that doesn't fascinate you, then I don't know what will. I love Larabars almost as much as I love bread. ﻿3. I'm afraid of parrots. 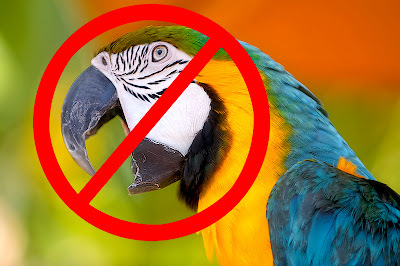 I don't think it's normal for non-human animals to be able to talk and whenever I hear a parrot sing or talk or mimic or whatever the heck they do, it totally freaks me out and I run away crying like a little baby. Want more? Click here for my last TTT post. Do you have any strange fears? Spill! I hate spiders. I don't guess that is strange, but i'm super super afraid of them. Soooo happy to read you love grocery shopping. You have a new household chore now when you move back home this summer. Thanks. Love, Mom. Larabars are so delicious ... I can only buy them one at a time, I'd go crazy on them! I have an irrational fear of scurvy. Yes, the 1600s pirate disease. Any time I am going to be in a car, plane, train, etc., for more than about five hours, I need to bring lemonade or something or I get panicky. I don't think any fear of anybody is strange because a fear is a thing that is not cool at all. We are all different thus our fears are different. That kind of driving looks uncomfortable and with our cars here in SA which is not automatic, we drive with a stick, it is not possible to drive that way. so smart of you to pack a meal for dinner!!!! I always forget to do stuff like that! <3 you rock! whoohooo 2lbs gone!